Valiente is a 2004 Multi National Champion Bay PRE Andalusian stallion. 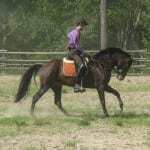 His sire was Quimerico KF and his dam was our foundation mare OA Sienna. Valiente was shown by dressage rider Sven Smeink in 2008 as a 4 year old at the Canadian National show where he won numerous national titles in performance including Dressage Suitability Open and Dressage Suitability Jr Horse to name a few. Valiente was sold as a 4 year old and resides in the Chicago area.